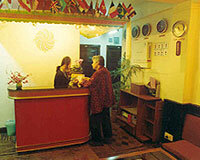 Dekeling Hotel is situated near the Chowrasta square in the heart of Darjeeling. 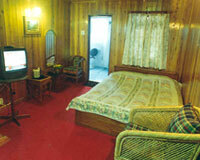 Dekeling Hotel is a renowned hotel in Darjeeling under the management of Deveka family. Dekeling Hotel is an epitome of unrivaled combination of convenience, comfort and luxury that comes at pocket friendly values. Dekeling Hotel enjoys scenic view of Darjeeling town and the majestic snow capped Kanchenjunga range. Suitably surrounded by lush green natural backdrop and close to many hot tourist destinations of the hill station and being situated near Chowrasta the Dekeling Hotel offers the finest deal in town. Dekeling Hotel offers 22 well appointed rooms ranging from luxury to economy accommodations. Some of the room facilities are in-house lounges, cable television, telephone, laundry service, cozy wooden attic room with lounge & library and chimney fire. Dekeva's Restaurant: A multi-cuisine restaurant serving Continental, Indian, Tibetan and Chinese delicacies.